The wonders of the internet mean that I am so lucky to have met some truly amazing people who have talents beyond anything I can hope for. One of those people is Sarah…well, I’ll just let you read on! For those who don’t know you, can you tell us a bit about you? I’m Sarah – a small, ginger, avocado eating, book enthusiast. I like pandas, twitter and the idea that people are inherently good, most of the time. I was born and raised in Cornwall but now live in Cardiff with my fiance and pet panda. The idea came from faving over 3000 images on flickr but not having a good way to then view them. At the time the flickr favourites page was a row of square thumbnails and I wanted a place where I could put all the photos together and flick through them easily. I honestly can’t remember where the name came from – I remember batting things back and forth with Sarah McLean (@_sarahrose, my co-editor for the first two issues) and Telegramme arrived and stuck. What inspired you to start a photography magazine? There are very few photography magazines these days that are focused on the end result. Most of them are technique driven – which is very useful but not the niche I was hoping to tap into. I wanted a static place to showcase photographers that I had found and enjoyed. Blogs are great for new content but old content very quickly gets pushed down the page – with a magazine someone viewing it in two years time will see the same content as someone viewing today. I also thought a magazine style layout would be a nice way to organise photos together and I also just wanted to see if I was capable of it, to be honest. I’d never worked with inDesign so it was a challenge to myself to learn a new program and a new skill. Most of the themes in the issues are fairly fluid – I tend to think of a theme where individual photos will look nice together (so polaroid photos for example or pictures of tattoos) and then search for them on flickr. If I can find enough that I enjoy I make a gallery of those photos and contact the people in it to see if they’re interested in taking part. Then if I get enough responses (I usually get about a 70% return rate, the other 30% never reply) I put it in the issue. If I don’t, the theme gets ditched. Probably about 60-70% of the photos in Telegramme are shot on 35mm film as opposed to digital. I have nothing against digital (I shoot on a DSLR as well as an SLR) and enjoy the process but I think 35mm has a special quality that you don’t see often in digital photos. I also thought it would be fun to create a magazine focusing on what most people think is a dead medium. I don’t necessarily think digital photography is better than 35mm or vice versa, but they’re certainly different so why not celebrate that? What other magazines do you admire and why? Is it awful to say that I don’t read magazines? I don’t. I used to read Creative Review when I was in my late teens, and I always enjoyed reading Marketing for the news on the latest advertising campaigns (my degree was Advertising and Marketing Communications) but I’ve never enjoyed reading magazines that are aimed at women. I don’t enjoy celeb gossip and the culture of ripping other people to shreds for entertain doesn’t really do much for me. I’m also not that into fashion (ha) so magazines with high editorial content left me feeling mostly confused and out of the loop. I do, however, read a lot of blogs. I recently had a clear out of all the people that I didn’t agree with or who’s posts weren’t making me happy to read and now my feedreader is a much brighter place. People like Maggie Mason from Mighty Girl (www.mightygirl.com) and Heather Armstrong (www.dooce.com) make me far less scared to grow up and become an actual adult, these women are doing it with aplomb. I love reading cooking blogs, A Beautiful Mess is lovely without being too twee or too smug and I’ll always have time for a geek out with XKCD. I’m a big believer in doing what makes you happy and the mainstream magazines available to me just don’t do it for me. Whats the most difficult part of creating your own magazine? The sheer effort of creating something 116 pages long with 60 contributors, by yourself. Sarah helped me tremendously with the first two issues (with ideas, support and finding new collaborators) but no longer has the time to help out. It’s difficult to dedicate time to it when I’m tired or busy but I know if I don’t there isn’t anyone else to pick up the slack. Creating something on your own can be daunting, to be honest. I had no idea if people were going to like it or even care but the response has been overwhelmingly positive. I took a break between issues two and three because I burnt myself out working too hard and too long on it. The encouragement from Tzevai (my fiance) and friends plus a few people that I know on twitter but wouldn’t count within my inner circle was heartwarming – if people I didn’t know were encouraging me to pick it up again then I figured it was probably worth putting the time and effort into. What does the future hold for Telegramme? 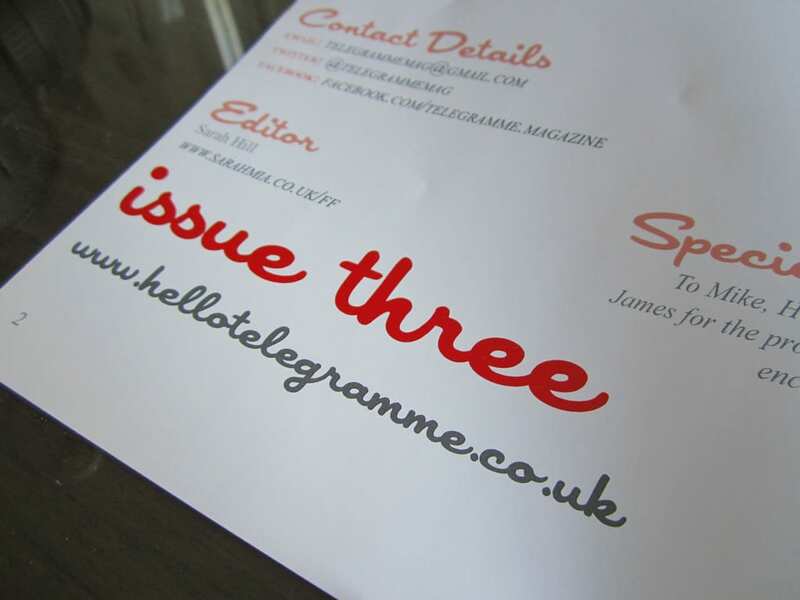 I’d love to host an exhibition for some of the artists featured in Telegramme, but I’m not sure if I’ll ever be in the financial position to do that. I think it would take some luck with a venue and artists being willing to print and frame (and transport!) their own works to make it a reality, but maybe one day! Hopefully I’ll be able to continue creating new issues – I’ve never been interested in monetising the magazine and luckily it costs me very little to produce (if you don’t count the time that I spend on it) so I’m intending to keep it ad free and always free to view online. I’d love to be able to do more printed copies (and hopefully have them delivered without Royal Mail added dents this time) but whether or not that’s financially viable is a whole other story. What advice would you give to others thinking about starting a similar project? Don’t think it won’t be hard work, because it will. But also remember that if you’re passionate about something and you put time and effort into creating it then it will be worth it. Give yourself a timescale and then pretty much double it until you’ve learnt how to do what you want to do. Learning new programs like inDesign took me longer than I thought but now I know how to use them the process is much quicker. Be honest, be friendly and be polite. Don’t steal other people’s images or work without credit or acknowledgement, always be up front with people about what you expect your project to be and try to included people wherever you can. 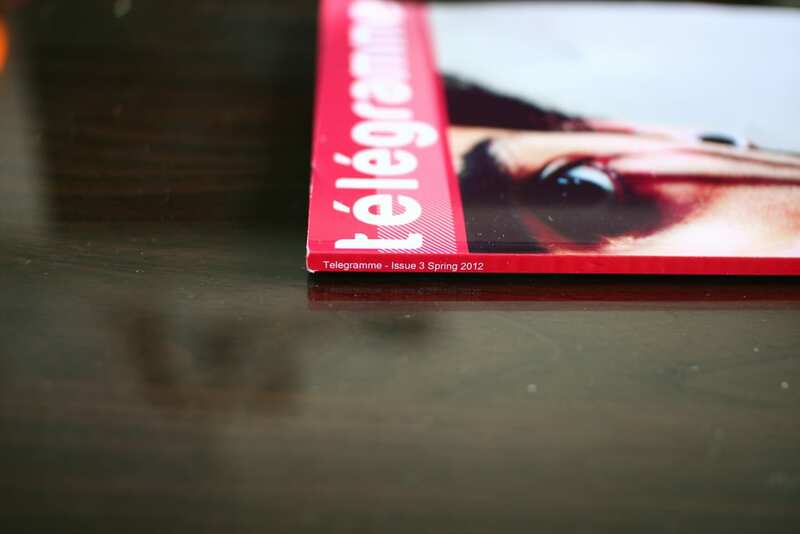 I read the first two issues of Telegramme cover to cover the other nigth, and I enjoyed it so much! 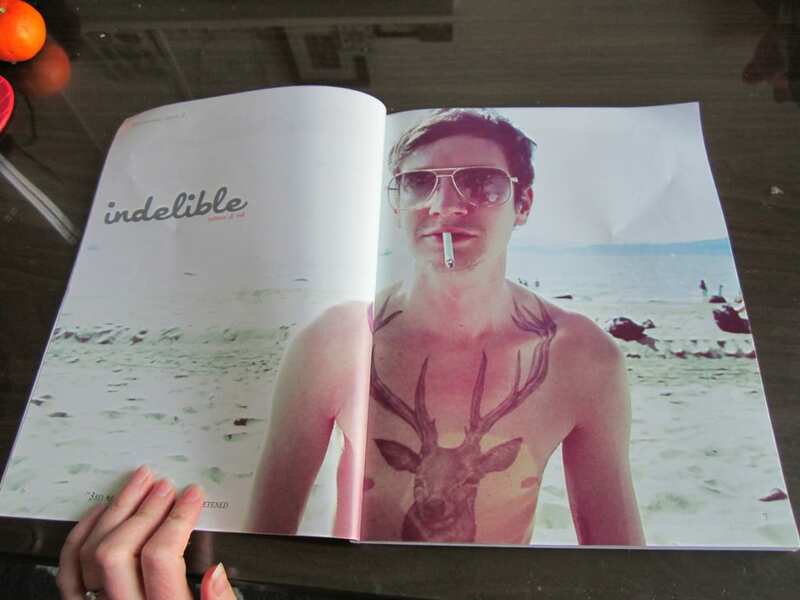 Sarah has done an amazing job with the magazine!